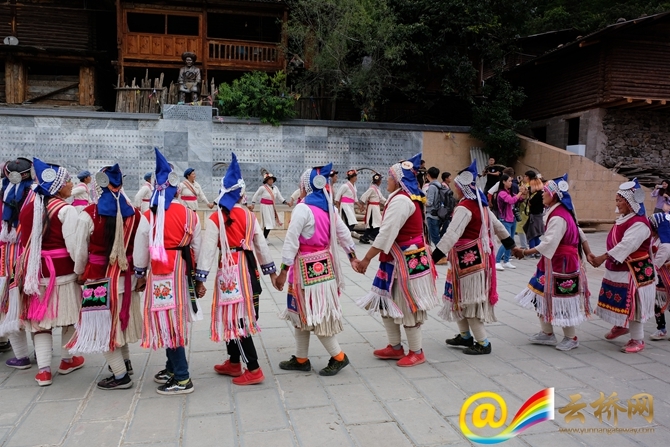 Achi Mugua is a traditional dance of Lisu people living along the Lancang River in northwest Yunnan’s Diqing Tibetan Autonomous Prefecture. Without musical instrument for accompaniment, Lisu people follow their singing while dancing. During the Yunnan tour of “International Students Focus on China”, the students visited the Tongle Village in Diqing and had their first try of the Achi Mugua with local Lisu people. The prelude of the song sounds like goat’s bleating. Hence Achi Mugua is also regarded as the “Singing and Dancing of Goats”. The tune of the singing varies. It can be either slow or fast. During their visit, the students participated in the dance with local people and the natural flow of the rhythm brought them comfort. They almost lose themselves in the joy and cultural uniqueness of Lisu people. Achi Mugua was inscribed into the list of the national intangible cultural heritage in 2006.